A press conference was held earlier today at the Vinsetta Garage in Berkley Michigan where Tim Kuniskis (Head of Passenger Car Brands – FCA North America) presented the 2017 Dodge Challenger T/A and Charger Daytona. The video of the presentation is shown below. It was exciting to hear, and we like the looks and implied performance of the cars… but…..
We will say that we are a bit disappointed… the Dodge motto “Domestic, not Domesticated” that Tim started the press presentation with is frankly as dated as the underpinnings of these two cars are (they date back to a very old Mercedes E class chassis, one generation older than what then-parent company Mercedes itself was selling at the time). What will Dodge say when – finally – the platform (and given FCA finances it’s still an IF) of the new Alfa Romeo Giulia is used for the next generation of Charger and Challenger? That’s a state-of-the art chassis, and it is most definitely not “domestic” in any sense of the word. Also, Tim stated that “our competitors have decided to switch gears, they’ve gone in a different direction, they’ve gone to smaller cars, more lighter cars, more track-focused cars”. That just rubs us the wrong way – it’s all an excuse for “larger, heavier, and dated”. Tim made the point that the original T/A was designed as a race car (true, but it was a bit large for the class even then), and that the current one is not. We’ll second that, the current car is just far too large (>197″ long) and heavy (>4200 pounds for the R/T at 54%/46% fr/rr weight balance and >4400 for the Hellcat at 57/43 fr/rr). We’ve seen people try Challengers on a race track for HPDE and they are just far too large and ungainly (and we’ll say that we are also very disappointed in Bondurant for switching to Challengers). The reality here is that Dodge can’t afford to update these very old cars to a more modern chassis, plans have been put off and moved out for years – but to be fair Dodge didn’t even have a chassis to move to anyway until Fiat came along. So the plan is to update the current models as much as possible inside their large-car “cruiser” space, make some excitement with models such as these, enjoy the very low gas prices, and wait for the next chassis to become available. When it finally happens, we’d like to see a Challenger that is the same general size and weight as the upcoming 2020 (S650) Mustang and the future Alpha+1 Camaro. The Giulia platform can do it, although it will be an expensive platform to use. Dodge will mitigate production costs by sharing suppliers with Alfa, and also by likely building the next Charger and 300C on the same platform. But open questions remain” first about the use of the Giulia platform at all, then the ever-present dark cloud of CAFE standards, and finally by engine availability. Tim is an excellent presenter, and is making the best out of what he has to work with. But there is just a bit too much bluff here and it offends us in the same way as Chevrolet’s ads claiming that a steel pickup truck bed is better than Ford’s military-spec aluminum bed. Again, there as here, it’s just because they don’t have the product development money (but it’s already known that they will in the 2018 timeframe – which makes this even worse) so they consciously choose instead to appeal to a narrow segment of the audience or an audience who doesn’t know any better. Personally, we prefer to set our standards bar high and to keep moving forward at all times. Now don’t get us wrong: we’ve been a big supporter of the Challenger ever since it was reintroduced to the market. We love it’s looks. And we’ve focused sections of our website and coverage on it from the start. But too many years have passed and the Mustang and Camaro are pulling farther and farther away. The gap has widened considerably. We believe in Dodge, and we want to see the Challenger successful – we know the engineering team can do it given a chassis and a budget. But in the end the budget has failed. August 16, 2016 , Auburn Hills, Mich. – Dodge believes the golden age of performance cars is now, making this year’s Woodward Dream Cruise the perfect time and place to reintroduce the brand’s two famed, race-bred nameplates — the new 2017 Challenger T/A and Charger Daytona, muscle cars that deliver even more performance and precision to the naturally aspirated HEMI® V-8 lineup with unique powertrain induction and exhaust enhancements, chassis upgrades for greater handling and braking, plus functional performance styling appointments inside and out. The new 2017 Dodge Challenger T/A and Charger Daytona models are available with the 6.4-liter “392” HEMI V-8 naturally aspirated 485-horsepower engine, or the 5.7-liter HEMI V-8 with up to 375 horsepower with the all-new electronically controlled active performance exhaust system. Production for both Challenger and Charger models will begin this fall with Charger Daytona models available for order in September, followed by Challenger T/A models this October. Initially built for the Sports Car Club of America’s (SCCA) Trans Am racing series in 1970 with only 2,399 ever built, and considered one of the most sought after muscle cars of all time, the new 2017 Dodge Challenger T/A model lineup builds on this legacy with three track-capable models loaded with unique appointments and performance hardware – Challenger T/A, Challenger T/A Plus and the Challenger T/A 392. 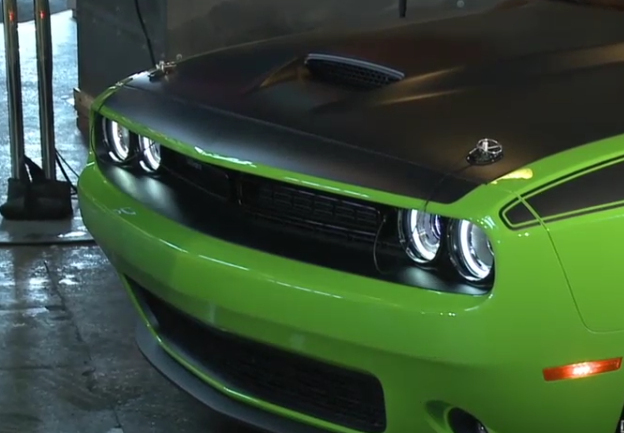 For drivers who want to be a part of the Dodge T/A legacy, the new 2017 Challenger T/A builds on the standard content of the 375-horsepower Challenger R/T model, adding functional performance hardware, which includes the new “Air Catcher” headlamps with LED-illuminated T/A logos; NACA ducted hood now designed to feed a modified SRT Hellcat air box with Mopar conical filter, which optimizes cold air intake through these two signature fresh-air inlets; an all-new 2.75-inch electronically controlled active performance exhaust system; and 1-inch wider 20 x 9-inch Mopar lightweight forged-aluminum wheels finished in Hyper Black II. The Super Track Pak is added for a full complement of race-bred chassis upgrades, including a 0.5-inch lowered suspension, high-performance Bilstein shock absorbers, performance brake linings, three-mode electronic stability control (ESC) calibration with “full off” and high-performance Goodyear Eagle F1 tires. The Tremec six-speed manual is standard, while the innovative TorqueFlite eight-speed automatic transmission is available and includes Sport mode with paddle shifters, plus Fuel Saver Technology with four-cylinder mode and interactive Decel Fuel Shut Off (iDFSO). Heritage-inspired Dodge exterior appointments include a new Satin Black painted hood and Satin Black front fascia, roof and deck-lid graphic paired to the T/A bodyside stripes; new wheel center caps featuring the Dodge stripes; “Challenger” script grille badge; Satin Black fuel-filler door with heritage “FUEL” lettering and black deck-lid spoiler with Challenger T/A badge. For an even bolder throwback look to the original 1970 model, factory-installed hood pins are available, along with all-new and limited-production Green Go and Yellow Jacket High-impact Paint (HIP). Authentic aluminum interior bezels combined with Black and Gloss Black appointments provide Challenger T/A with an athletic cockpit. Premium Black performance seats with signature Houndstooth cloth inserts give the driver and front passenger greater lateral support. The Dodge performance steering wheel features performance contouring, and for added retro style, the 1971-inspired “tic-toc-tach” gauge cluster features Bright White concave faces and Gloss Black details. Premium velour-bound floor mats with embroidered Dodge logo are also included. The new 2017 Dodge Challenger T/A model has a starting U.S. Manufacturer’s Suggested Retail Price (MSRP) of $37,390. (All prices exclude $1,095 destination). Adding to the Challenger T/A model’s standard equipment, the new 2017 Challenger T/A Plus includes unique heated and ventilated Nappa leather performance seats in Black with Tungsten accent stitching and embroidered “T/A” logo; all-new fourth-generation Uconnect 8.4 system with Apple CarPlay and Android Auto smartphone integrations, faster startup time, enhanced processing power, vivid imagery, plus higher resolution and sharper graphics; Dodge Performance leather-wrapped steering wheel with power tilt-and-telescoping column; six premium speakers and 276-watt digital amplifier. Expanding on the Super Track Pak’s capability, the Challenger T/A Plus adds a shortcut button to the Dodge Performance Pages embedded in the class-exclusive and all-new Uconnect 8.4-inch touchscreen fourth-generation radio, which provides visible performance information, such as a programmable shift light indicator, reaction time, 0-60 times, G-force indicator and lap times in the 7-inch thin-film transistor (TFT) customizable cluster display. This new Uconnect system also includes Apple CarPlay and Android Auto to further smartphone integration. The new Challenger T/A 392 ups-the-ante with its best-in-class 485 horsepower and 475 lb.-ft. of torque, delivering up to 113 more horsepower and a 65-lb.-ft. leap in torque compared with the 5.7-liter Challenger T/A models, representing more than a 30 percent jump in horsepower and 18 percent jump in torque. The coupe’s best-in-class power enables it to turn mid 4-second 0-60 mph times and low 12-second quarter mile times. Adding to the standard equipment found on the Dodge Challenger T/A Plus, the new 2017 Challenger T/A 392 includes a 6.4-liter (392 cu in) HEMI V-8 engine with 485 horsepower, plus signature “T/A Air Catcher” headlamps and directed cold-air NACA duct hood systems connected to the more powerful mill; ultra-high performance Brembo six-piston front and four-piston rear brakes with vented rotors, unique front suspension geometry, all-new 20 x 9.5-inch forged aluminum wheels finished in Low Gloss Black, P275/40ZR20 Pirelli three-season performance tires, “392” fender decals, 180-mph primary speedometer, electronically controlled active performance exhaust system and 220-amp alternator. Adding even more excitement to the new 2017 Challenger T/A and Charger Daytona models, all-new and limited-production Green Go, plus a revised Yellow Jacket hue, build on Dodge brand’s HIP legacy. Go Mango and TorRed hues from the exclusive HIP collection are also offered. Also joining the paint lineup for 2017 are Destroyer Gray and Octane Red shades, while White Knuckle, Redline Red, Pitch Black, Granite, Billet, Contusion Blue and Maximum Steel are also available.